From the previous article of review TLA in April. Now it’s November, the very same year, 2010. I need to update what I earn while snoring! In the reality, you could earn maximum about $100 a month for just 10 text link, isn’t that great?. Here I have to correct it because I earned over $100 from one site lately. Until now I earned from TLA for $2,021.25!! This month project earning captured.. $120!!! So I suggest you to try and next article will be about another text link ads company I use their service. 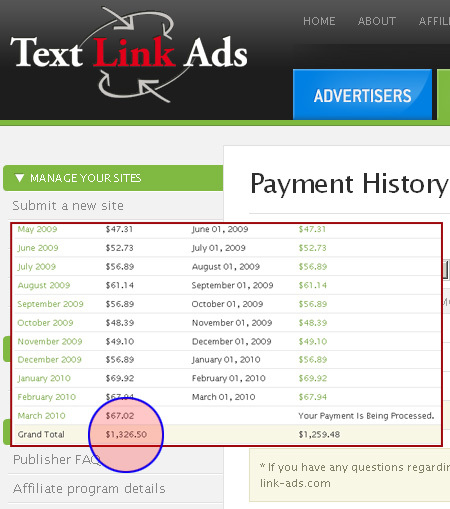 I have use Text-Link-Ads service since April 2007 and found out that it worth to use their service. From low and unstable earning website, now it is almost stable earning.. 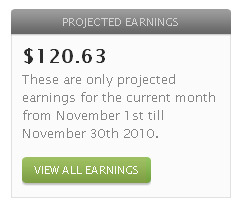 I earned every single month until now $1,326.50 already. Everyone in this market know that making a website need advertisement or sponsors. Either image/flash/popup or intelligent relevant ads like Google Adsense… there is a very simple one…. very old type of advertisement… It is “Text link advertisement“. Text-Link-Ads is a company that publish text links on their network via XML which cached on the publisher website. How much the quality of website you have, how much you earn from there. This really depends on how much quality of your website has and how long your website has published on the internet. Let’s look at my case. At april 2007, my website is 7 years old. I would say my website has unique contents. I have not much earning on the website either Google Adsense or any ads network, but it’s nothing to lose to add another ads that doesn’t make your website crap, isn’t it? TLA allowed you to place up to 10 spots of text link so the maximum is 10 links multiply with the earning for each link. I sell about $25 for each link (not yet deduct TLA commission) so the maximum is $250 each month (If I can sell all 10 spots) In the reality, you could earn maximum about $100 a month for just 10 text link, isn’t that great?. You first need to submit your website so they can review if your website has good quality, but hey!, you have nothing to lose, just submit it. Apply here. At first, I don’t even think I could have them approved, but I did it. You might have to wait for 3 – 4 months before you could get a first advertiser. If you have a great site, you would get it right away on the first month. 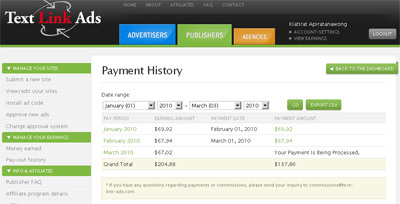 TLA pays via PayPal (no fee) and the other ways, so get start and earn money for your website. From the screenshot above, here is a TLA pdf statement that you could see it in detail. Please remember, this is only 1 website earning!! and next post I will review another ads network which is invited me from TLA and it is as good as TLA and earn even more sometime. Again.. I wanna tell you it is only for one website.. If you have more quality website, you earn more.